The Long Road to China: Sunday Snapshot - "Perspective"
We all tend to view things at eye level or from a standing position. So my goal yesterday at the park, was to look at everything from a different perspective. It always amazes me how much more interesting something can appear when you do this. 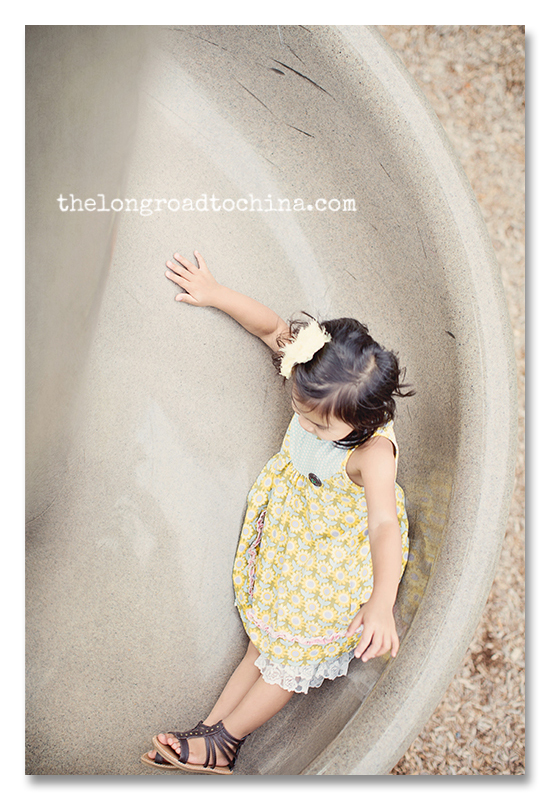 Even though I did not get her face in a lot of these photos, the emotion is still present when you view them. I shot from down on the ground with camera pointed up and then I climbed up and did the reverse...shooting down to the ground. 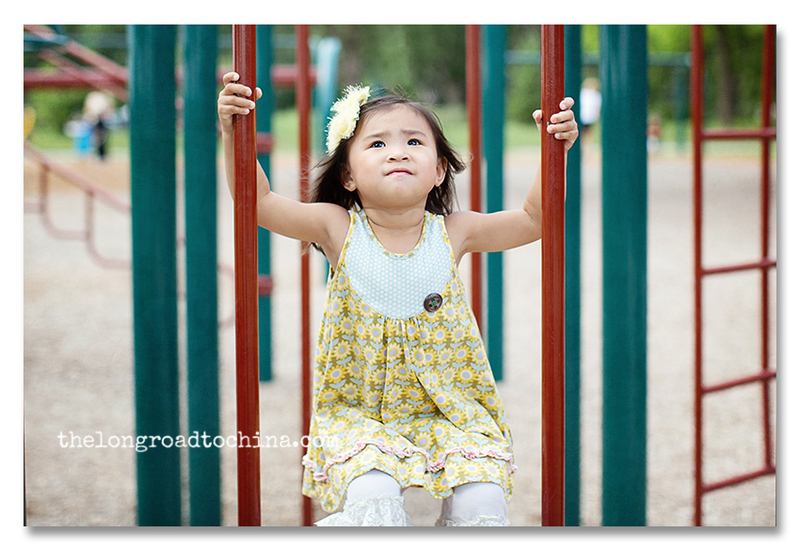 I loved the look of concentration on her face here as she climbed up hoping she could reach the monkey bars. Still a little too short!! I rarely center my subjects dead on in a photo, but this one was definitely an exception....it begged to be centered. I am about two weeks into my latest "push past your comfort zone" class. It is another fantastic group of ladies..... and they are keeping me on my toes(that is why I have been scarce around here). This week we have been discussing rules of composition. The topic of posing your subjects vs just letting them do their thing came up in our forum, so these photos were a way for me to show by example that you can indeed take every day candid types of photos that are non posed and at the same time follow some of the basic photography rules of composition without having to actually tell your subject where to stand and what to do. Since Sunday Snapshots are now about achieving the fundamentals of photography, I figured I would share a little here too! I was lying on the ground in front of the swing with my camera aimed up towards the sky. 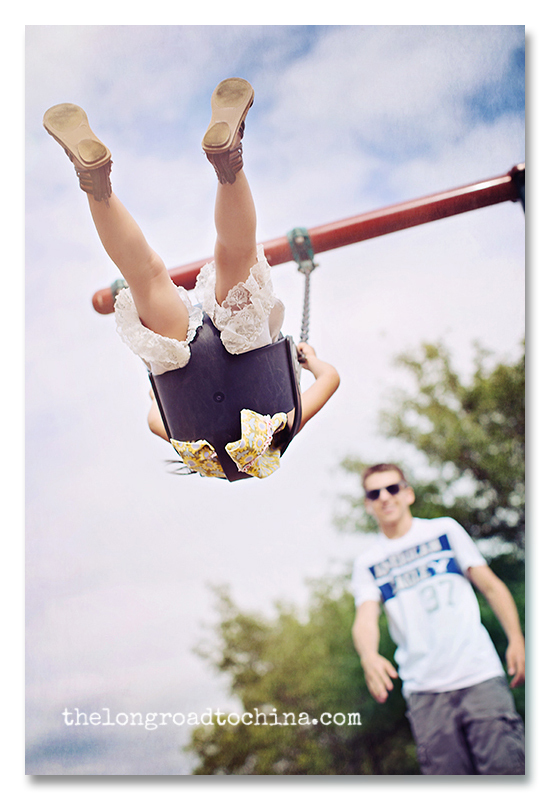 I was shooting in the spot meter mode and focused on the bottom of the swing. 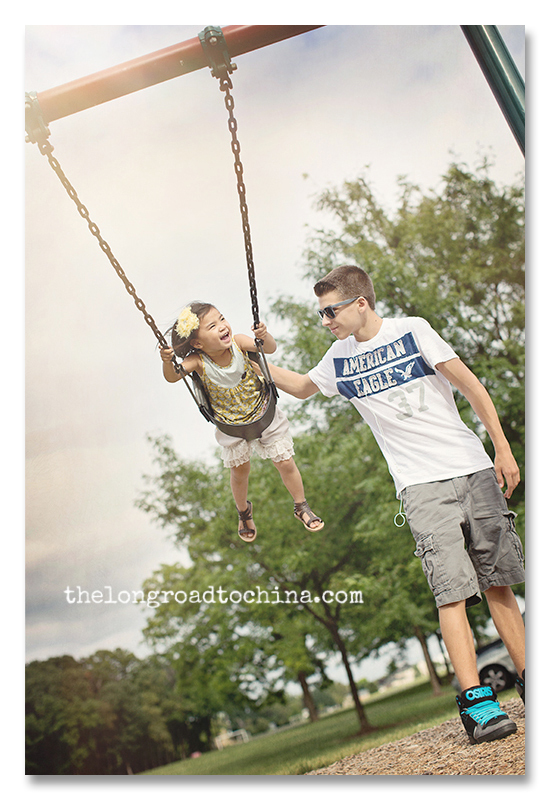 The fast shutter speed is what allowed me to freeze the motion of the swing. Photos were all processed using Florabella's Classic Color Set and Sarah Garnder's Beyond the Lens Texture Set. Lisa these are so cute! You inspire me to get this tired old body down on the ground to get the unique perspective of a shot. I love them. Makes me want to take my baby girl to the park. PS. LOVE the outfit. And those shoes are too die for. Reags is the best dressed toddler around! These are amazing! Love the ones of the girls sliding! And the one of Reagan swinging, that smile! LOVE all of these...and not only do you have all kinds of perspectives here, some very creative ones...you have lines, curves, frames...fabulous composition too!! And Reagan is as cute as she can be!! Yup. You rock! Plain and simple. As always, such an inspiration! Just printed out this week's assignment, hopping in the shower, grabbing the camera, and letting life happen! Happy week to you "teach!" You really are amazing Lisa. I have seen you grow into one of the best photographers in the US and I mean that. I watch all the big names and your skill and eye are as good as any of them. I have so much to learn from you. 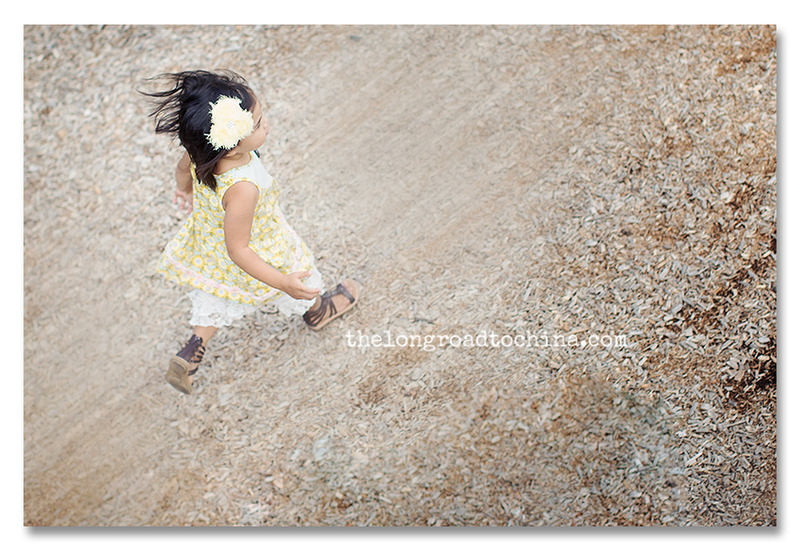 I love, LOVE the picture of Reagan running with her hair blowing around her. Beautiful!! I just love pictures like these. Carefree and far from the norm. Reagan is getting so big. Where in the world is the time going? Hope you're enjoying the rest of the weekend. We have a rainy day so we've been doing a whole bunch of nothing (and I"m loving it!). Lisa I love these pictures! I continue to feel blessed to learn from one of the best! 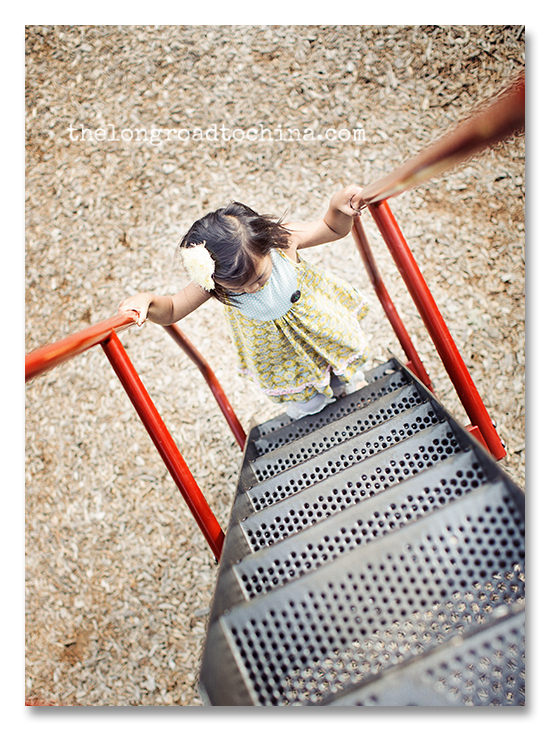 You make me want to run to the park with the kids and try shooting from a new perspective. It has been sooooo hot and humid here we have lived in the water or inside. Hoping for a park day soon and want to try shoot from a new perspective. Thanks for continuing to inspire me through your photography! Love the first one, it's just sooo much fun. 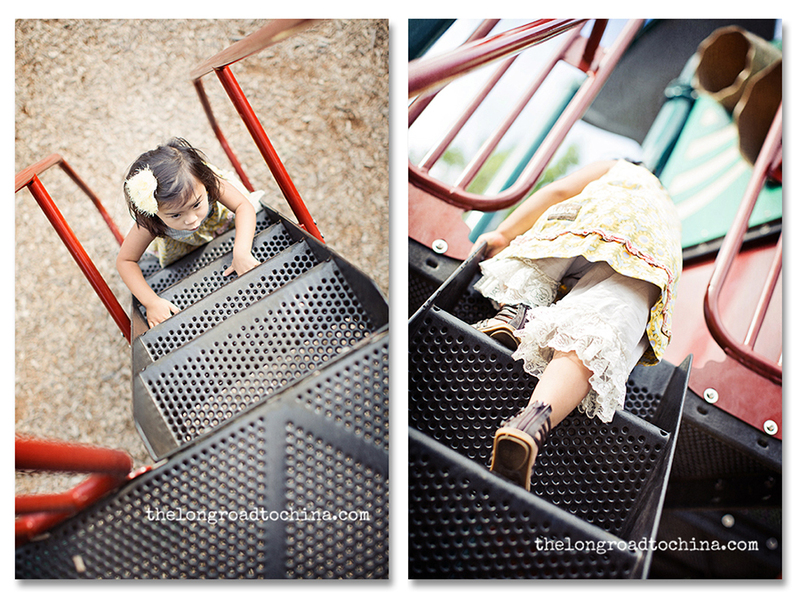 And the 1st one of Reagan climbing the steps, the concentration on her face. And the thrill on her face as she runs for her next "go". I love those "non-face" photos. Brian thinks that makes me weird:) Love that they play and don't even notice the camera. Beautiful photos of Miss Reagan! Love these shots!! And love her sweet expressions! SO fun! Kinda makes me feel like I was there with her. Can't wait to see that sweet baby in just a few months!! Those are great shots. I'm glad I found your blog...I can learn a lot! Love this! I am not a photographer, but this is one of my favorite things to do when I paint! Perspective truly makes for very interesting compositions! Park pictures are truly some of my "better pics". I have tons of THE GRANDS and Bre, swinging, running, and peering thru little open ports etc. It's funny, though because whenever I grab the camera and shoot pics of Bre..she will always STRIKE A POSE! I guess I gotta break that mode!! Love these of Reagan!! I TRULY CAN'T WAIT TO JOIN ONE OF YOUR CLASSES!! I'm sooo excited!!! Awesome- as always! I felt like I was moving with her on some of those because of the perspective. What a fun time! thanks so much for sharing your photographic techniques with us; it is much appreciated. your girls are simply gorgeous, as are all of your photos. p.s. 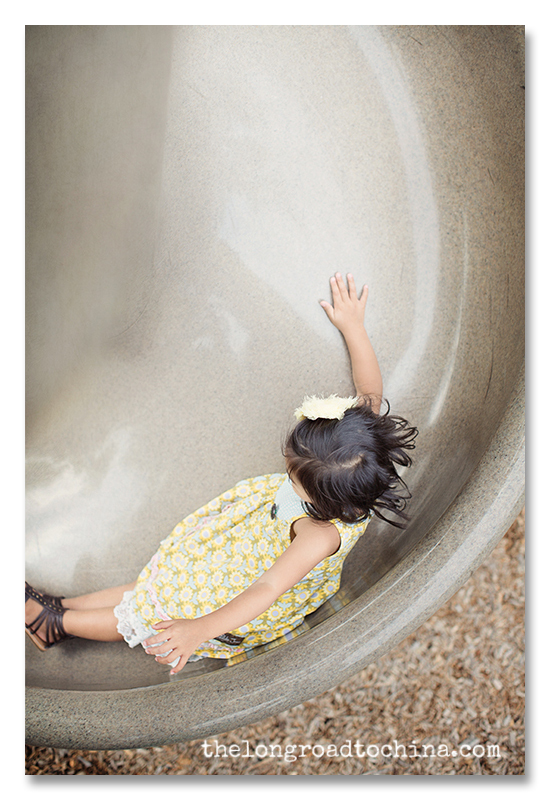 did you take those photos using the Aperture Mode and in Raw?